Τhe Slap-tree is the Odyssey of two lovers, both communists, overpowered by the civil war barbarity in the aftermath of World War II Greece – a documentary novel portraying the efforts of this powerless country to survive in dignity amidst the most undignified social conditions in the 20th century. 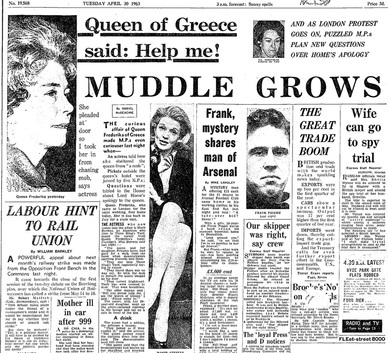 The famous slap of Betty Ambatielos to Queen Frederica of Greece (in London, outside Claridges Hotel, April 1963) as part of her efforts to get her husband, Tony Ambatielos, released from prison (political prisoner from 1947 onwards at the age of 33) inspires the plot of the narrative. The importance of this engaged political novel lies in that, through the story of its two protagonists who struggle to survive amid the political agitation of the period, it throws a sidelong glance to the whole history of contemporary Greece – especially to that part of it which is chained to a conservative, long-standing petit-bourgeois culture. This class portrait of half a century ago brings to mind similar harsh situations that take place in Greece of today's social, cultural and financial crisis. And yet, the novel is about hindered love. The stead-fast comradeship of a passionate woman to an imprisoned activist; both of them stubbornly enduring the somehow awkward situation of struggling at the same time for the same social dream – only separately: for he spends his best years in the prison's seclusion (which means, in the long run, outside the real everyday world), while she has to lead a real, painful life that finds no place to any emotional outlet except that of a constant fight to get him released. What in fact has been the dramatic experience of thousands of political prisoners and their families in Greece during the sixties, in the Slap-tree is portrayed through close observation of that couple's possible life in and out of prison: for Betty mostly in England of the "swirling" sixties, for Tony inside the bars of an autoritarian, quasi dictatorial state, whose politics have been directed by the American geopolitical strategy of the period. On the political context, the novel, while being critical to the problems of the stalinist left stresses the crushing weight of the foreign involvement in the greek state of affairs and the way this condition has ever after controlled the lives and deeds of a people terribly exhausted from every point of view after a World War and then a Civil War. This novel has been discussed extensively in the press and has received a substantial number of praise reviews in Greece. During the end of the Second World War, for some the Nazi occupation of Greece during it clouded the fact that the pre-war regime had in fact been itself fascistic. The only effective anti-Nazi resistance inside Greece was Communist-led. There had never been a strategy to win Greece for the Communist bloc, indeed the highly successful left-led resistance movement EAM/ELAS (Ethnikon Apeleftherotikon Metopon/ Ethnikos Laikos Apeleftherotikos Stratos) called for a government of national unity. Greeks in England formed a Greek United Committee in 1943 under the sponsorship of Sir Compton Mackenzie. But much of the practical support came from the Federation of Greek Maritime Unions (FGMU), which had its wartime base in Cardiff and Tony Ambatielos was based there as its General Secretary and a key figure in the overall strategy. It was in Cardiff that he met and fell in love with Betty Bartlett, a local Communist. In July 1963, Betty (under the name of Betty Bartlett-Ambatielos) produced the pamphlet “Give me back my husband: Release Tony Ambatielos and all the political prisoners of Greece. This prefaced a state visit of King Paul and Queen Frederika of Greece, against which demonstrators from a wide range of the left and peace movement booed Prince Philip and Queen Elizabeth for associating with the Greek monarchy, which headed a semi-fascistic state. Seemingly, this stunned the British royals considerably. For they – and wider society - had assumed a notion that they were intensely popular. Queen Elizabeth's coronation had only taken place ten years earlier. But it was as if the history and background of the Greek royals was designed to be a provocation. Protests and the associated counter-action against demonstrators were intense. For three days the centre of London had been a battlefield, with 5,000 uniformed police, and many plain clothes police, watching for demonstrators and frog-marching them to vans; several hundred people were arrested. One of the protesters was Betty Ambatielos, who burst through the police cordon to rush towards Frederika's carriage shouting, "Release my husband!". The furore over the visit forced the Labour Party's leader, Harold Wilson, to agree to boycott a state banquet. Back in Greece, the protests had such a big effect that they caused a political crisis which brought down the Prime Minister, Karamanlis, who had in fact advised against the royals’ trip. So that the royal party could see Shakespeare's “A midsummer night's dream” in security, the foreign office was driven to buy up all 1,100 tickets for one night’s performance at the Aldwych Theatre. Remarkably, the next day, the new Greek premier, Panayotis Pipinelis, gave Betty Ambatielos a 45-minute hearing. Shortly after, 19 of the prisoners - but not Tony Ambatielos - were freed as a gesture. No doubt the deep impression of extreme hostility to Greece amongst the British public saw releases in an attempt to restore its image. A limited return to civilian rule was permitted and, in the thaw, Tony Ambatielos was able to return to Britain to be granted political asylum and be re-united with Betty for the first time for 18 years. TO "PAUL & LAURA, TABLEAU D'APRÈS NATURE"